Wilam means home in Woiwurrung, the language of the Wurundjeri clan, and this stunning story depicts the many creatures who call Birrarung (the Yarra River) home, as it slowly winds from the mountains to the bay. Indigenous creators Aunty Joy Murphy and Lisa Kennedy collaborated previously on the picture book Welcome to Country. This book also includes contributions from Yarra River-keeper Andrew Kelly. It is written with Woiwurrung integrated into the English text and features a readily accessible glossary. The art of Lisa Kennedy is exquisite, with huge double-page spreads of river scenes that depict the diversity of life along the riverbank, and show both past and present intermingled. 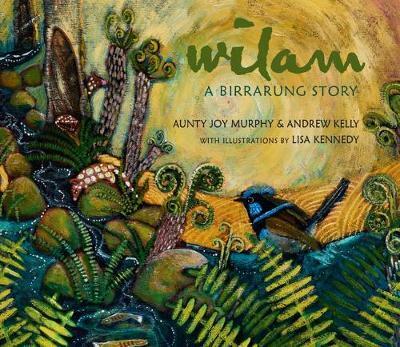 Wilam: A Birrarung Story is an absolutely stunning picture book that explores the teeming wildlife that exists along Birrarung. It teaches us Woiwurrung language for the river and its inhabitants, and asks us to reflect on the importance of the river not only to animals but also to the humans who live in its vicinity. This book is a must-have for every school, library and home in Victoria. Suitable for ages 4+. Angela Crocombe is the shop manager at Readings Kids.